The college football season is in full swing, as we are now into the fourth week of a full slate of games. Anthony Johnson, WR, Buffalo (6'2, 207): Buffalo at Rutgers, 12:00 p.m.
Anthony Johnson, Buffalo 1356 ??? ??? Impressively, Johnson put up the above numbers despite playing with three different quarterbacks that each had at least 57 pass attempts. He looks like a really solid No. 2 to me at the next level. Jaylon Ferguson, DE, Louisiana Tech (6'5, 269): Louisiana Tech at (6) LSU, 7:00 p.m.
Ferguson was tied for third in the country in 2016 with 14.5 sacks, but he cooled off a bit in 2017, as his sack total dipped to 7 with no forced fumbles while being the focus of opposing offensive line schemes. He is also regarded as a good run defender, and his tackle for loss numbers (41.5 of them from 2015-2017) back that up. At 6'5, 269 with long arms, Ferguson has good size for a 4-3 DE to go along with obvious athletic traits, and is being thought of by some as a possible first round pick. Bryce Love, RB, Stanford (5'10, 202): (7) Stanford at (20) Oregon, 8:00 p.m.
Love is a home run hitting running back with explosive speed who was an early Heisman candidate a year ago, when he racked up over 1,100 yards in just his first five games. On the season, he carried 263 times for 2,118 yards (8.1 YPC) and 19 TDs, while failing to rush for at least 100 yards in only one game. On the downside, Love is 5'10, 202, which is not ideal size at the running back spot in the NFL, which could relegate him to complementary back status. He also has almost no production as a receiver, which is almost thought of as a necessity for a smaller, complementary back. For the Eagles' purposes, Love is intriguing, as a speed back is an element of the offense that the Eagles lack. It will be interesting to see how the NFL values him. Troy Dye, LB, Oregon (6'4, 224): (7) Stanford at (20) Oregon, 8:00 p.m.
Dye is a long and lean linebacker with coverage skills who led the Ducks in tackles each of the last two seasons as a freshman and sophomore. In 2017, there was a huge disparity in his total tackles (107) and the next closest Duck (65). He has also shown the ability to make plays in the backfield, as he had 26 tackles for loss (more than one per game) and 9.5 sacks in 23 games over his first two seasons. Jim Schwartz priortizes coverage ability in his linebackers, and Dye would fit right in, in the event Jordan Hicks is not retained by the team this offseason. 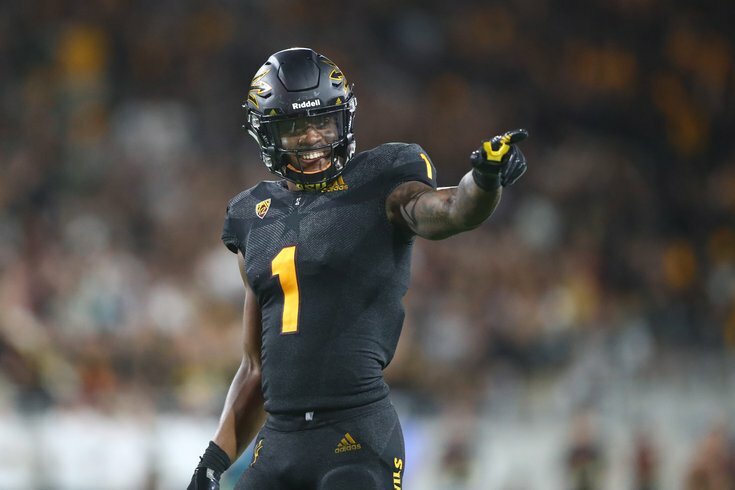 N'Keal Harry, WR, Arizona State (6'4, 213): Arizona State at (10) Washington, 10:00 p.m.
Harry possesses a lot of the same traits as Eagles receiver Alshon Jeffery, so I'm torn whether they would have interest in drafting another 50-50 ball winner, or if they want their passing attack to be more diversified. My sense is that it's the latter, but obviously, as we have seen so far this season, having a deep stable of wide receivers is a nice luxury. In 2017, Harry had 82 catches for 1,182 yards and 9 TDs. In three games so far in 2018, he already has 21 catches for 315 yards and 4 TDs.